As a parent, you are likely working to provide the very best for your child. From nutritious meals to hygiene procedures, there are many facets of life to focus on to help your little learner grow and thrive in this modern world. One way to equip your young child for success while opening their eyes to new places and people is to enroll them in our bilingual preschool. Crossing Borders Preschool was founded to deliver the most qualitative language immersion programs in Houston, relying on our expert speakers to promote an interest in being multilingual. In addition to our proven education program, our immersion preschool also relies on engaging activities to help your little star gain the basics of English, Spanish, French, or Mandarin. Each language is taught immersively, allowing your student to better grasp the mechanics of learning an entirely new dialogue. Our child development center is proud to provide the resources and education needed to make us your Top Rated Local® preschool in Texas. We dedicate our skills to helping your little one master a new language, but our efforts are rarely enough. 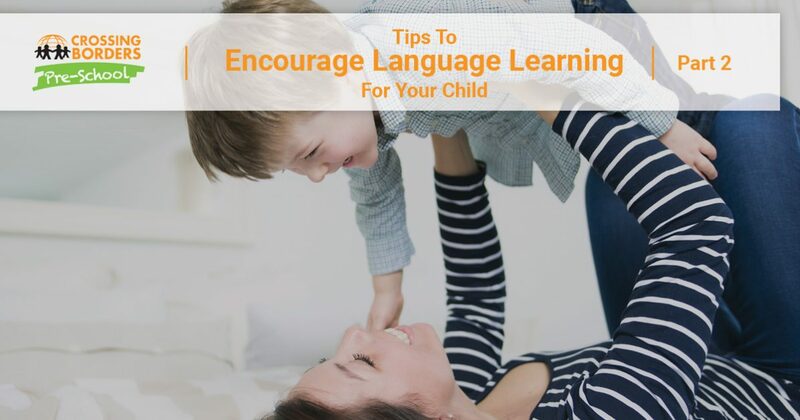 Today, we’ll continue to discuss helpful tips to encourage language learning in your toddler. When you are done, be sure to reach out to our language immersion preschool to learn more! Social groups. The advent of social media now allows parents to be able to connect with a wide range of groups. For you, promoting bilinguality in your child can be reinforced by placing them in such a group, scheduling get-togethers that allow your little one to interact and play with children of a similar age who are native speakers. Multilingual nannies. If you are in need of child care while you are busy, it can prove very beneficial to seek out a nanny or child care expert that is fluent in your target language. This approach allows your little learner to engage in bilingual practice daily. You can think of this method as an individualized version of our highly qualified immersion preschool! Pen-pals. One method that may provide a lot of support for your child’s language development is finding a pen-pal in a country that speaks your target language. With parental help, this process can help your little one to learn an entirely new language from a peer their age. Your little star will also learn about differences between geography and culture as well — a win-win situation! One of the best ways to promote daily language practice for your child is to learn the language yourself. Parents who enroll their children in a bilingual preschool often face the struggle of helping their students with projects, assignments, homework, and so on. Even if your child is passionate about Mandarin, for example, it can prove to be a challenge if they cannot practice their new skills with you. Crossing Borders Preschool is proud to provide a wide range of learning materials for children, but we fully encourage adults to take part in learning. As long as you are ahead of your child in the lesson plans, you can help to provide a full range of support for your multilingual student. From assistance on lessons to daily practice sessions, combining our early child development services with a bilingual household can help equip your child with the tools needed for a lifetime of success. Language and literacy. After repeated studies, results have found that immersion education experiences have led to major improvements in literacy and language comprehension. Not only will placing your child in an immersion program help them to be much more fluent into adulthood, it also helps to increase reading skills, comprehension, and versatility in terms of tests and group activities. Cognitive development. Learning a second language can provide major benefits when it comes to basic and complex thinking skills. Fluent bilingual speakers typically test higher for divergent thinking, problem solving, and pattern recognition. Experts point to mastering two languages as a primary factor in explaining these cognitive advantages. Economic advantages. One of the most tangible benefits of our language immersion program is the link between better employment opportunities and bilinguality. Being able to communicate between different parties as a translator is a highly sought position, giving your little one more versatility when it comes to career choices. With all of these benefits comes the challenge of designing and implementing an effective bilingual program that can effectively teach young students to the best of their current abilities. Crossing Borders Preschool is here to help you in this quest, offering quality language immersion programs to Houston families and beyond. Contact us today to learn more about our child development center or to enroll your child!